Nearly every open world game makes the player collect random garbage, and it’s almost never fun. Instead, collectibles often come across as content fodder, meant to pad up the time a player might spend with a game. Breath of the Wild is not like that at all. To catch some of you up to speed, in Breath of the Wild you can meet a lively character Hetsu, who loves to dance play with his maracas. One problem: the maracas are empty. So, Hetsu tasks you with finding Korok seeds, which he can use to fill up his instrument. If you bring some back, Hetsu can upgrade your inventory. It’s a good deal, though the value of this extended quest is more than mere transaction. I’ve found myself looking for Korok seeds just ‘cause, inventory be damned. At first, I found Korok seeds purely by accident. One time, for example, I saw a tall mountain looming massively in the distance. Nothing about it looked out of the ordinary, really—it was a mountain range, there was plenty of terrain just like it. But I got that itch, that strange, inexplicable desire to scale it, just to see if I could. I wanted to test out the limits of Link’s stamina. I wanted to test the boundaries of what the game would allow, wanted to see if would truly give me the freedom to do something completely unnecessary, just because the mechanics were available to me. Oh, it did. And on the very peak of that otherwise unremarkable mountain, there was a rock. I lifted the rock, and there was a Korok. I was taken aback: someone actually put something here! How many players would even see it? It felt nice to be rewarded for forging my own path, no matter how out-of-the-way and ridiculous my antics were. Since then, I’ve been obsessed with finding Koroks. They’re hiding everywhere (900, last I heard) but somehow, Nintendo has found a way to make their inclusion a playful and entertaining experience. 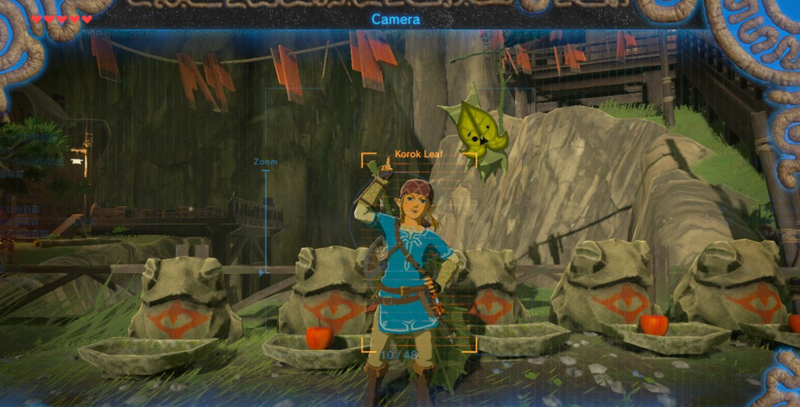 I’ve collected dozens of Koroks, and it never gets old. I’m spending a lot of time exploring just to find seeds, poking and prodding whatever I come across, in the hopes of landing a new discovery. I’ve found a Korok by melting ice. I’ve found Koroks by pushing rocks into giant holes. I’ve found Koroks by putting an apple on a shrine. I’ve found Koroks by climbing a fountain. I’ve found Koroks by putting a metal block on a random sculpture. I’ve even found some puzzles that I’m pretty sure are Korok-related, but I have no idea how to solve them yet. And every time I find one of these puzzles, it is a delight. Yes, many of the Korok solutions are simple. What I love about them, though, is that Korok seed puzzles have an innate video game logic to them, a sort of design sense that Nintendo truly excels at. Just look at Mario: how do we often just know the location of a hidden block, invisible to the sight? How do we know that in a side-scrolling Donkey Kong level, it might be worth going to the left, rather than the right? We don’t, really. We hope. We take a leap of faith. We feel, on a level that is almost intangible, that if we just do the right thing, we can untangle the mysteries of a world, we can come to understand it. This spirituality is all by design, of course. I know this. But when you’re out there, looking into Breath of the Wild’s horizon, wondering what secrets you’ve yet to uncover, you can go forth with the confidence that in this digital world, god is real and he made everything for a reason.